This old engine from the M&B railroad is on display in Blountstown, FL. 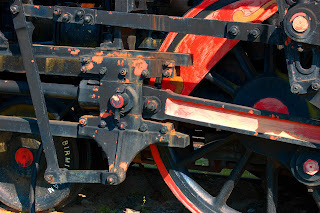 It was built in 1911 by the Baldwin Locomotive Works. My grandparents are buried in Blountstown and stories have it that my grandfather was a railroad construction engineer for this railroad and several others. They had 8 children, all born in different towns in the panhandle of Florida.